I absolutely love cooking seafood over fire! Scallops, shrimp, salmon and now steamed mussels! 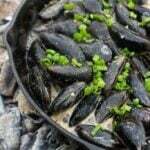 Steamed mussels is one of the most simple yet delicious dishes that you could make over hot charcoals. Not only is it impressive with the presentation, but it is a very flavorful meal. Every once in a while though, I will add beer to the mixture that they are steamed. This adds a fun twist of flavor from the beer that is hearty, malty and sometimes sweet. Combine that with the butter and the green onions, and you have a high class steamed mussels that takes 15 minutes to make in your backyard. First, you are going to light your Cowboy Charcoal in a chimney. Spread them out for direct grilling. 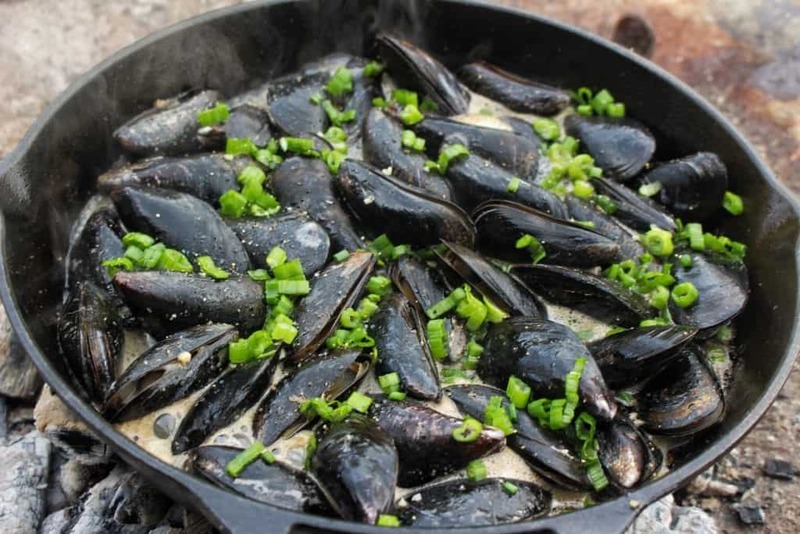 Find a cast iron skillet to steam in that will fit the amount of steamed mussels that you have. I chose my 14” skillet just to be safe. Next, you will make the steam broth by mixing butter, oil, beer, garlic, salt and pepper until it is simmering hot. Add the mussels into the simmering broth and heat does the rest. 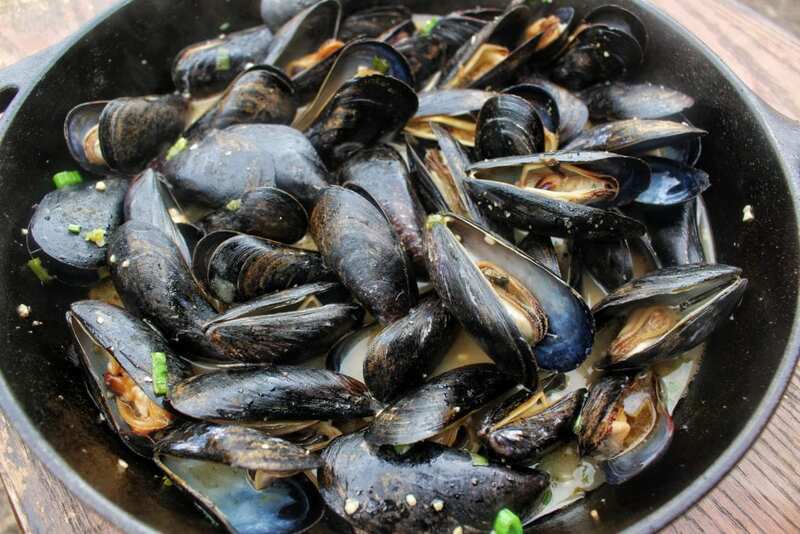 Quick note: if any of your mussels are already opened before cooking, then throw them away. This means the have died and are not good for eating. 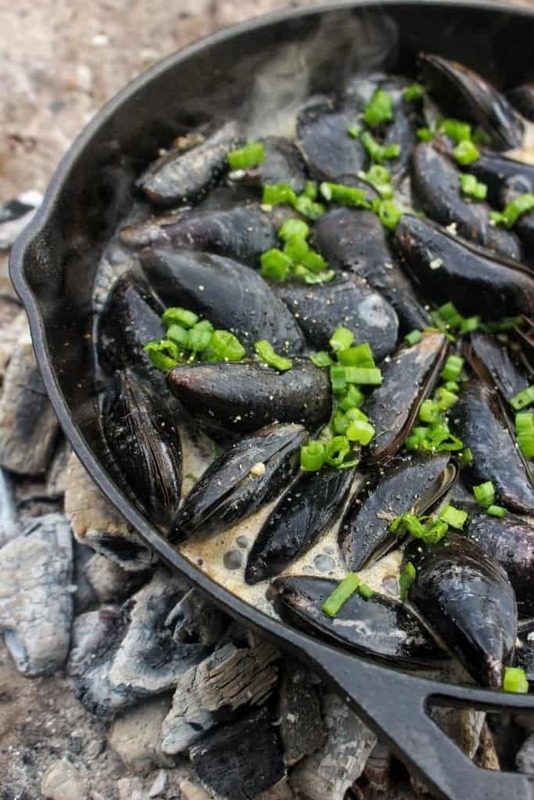 Lightly steamed mussels in a delicious mix of beer and other fun stuff all cooked over some hot Cowboy Charcoals! Use some Cowboy Southern Style Hardwood Lump Charcoal to light fire and let burn for 10-15 minutes. Once Charcoal is white hot, push into one pile for direct grilling. Place cast iron skillet over fire 2-3 minutes before cooking to preheat. First, add some canola oil and butter. Once butter has melted, add garlic, lemon juice, beer, salt and pepper. Stir and let simmer for 1 minute. Finally, add mussels and top with green onions. Let simmer until all the shells have fully opened (about 10-15 minutes). Pull skillet of charcoals, garnish with parsley, and enjoy! Equipment: Cowboy Charcoal, Cast Iron Skillet, and Tongs.